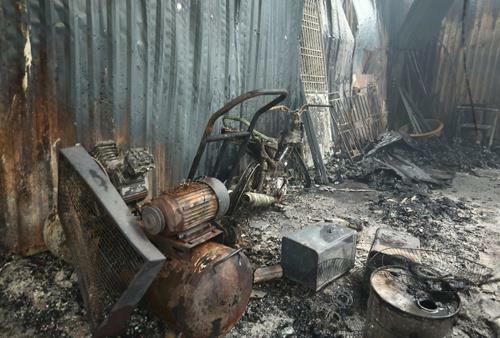 HANOI, April 12 (Xinhua) -- A fire broke out at four workshops here Friday early morning, killing eight local people, Vietnam News Agency reported. The big fire at Nam Tu Liem district, Hanoi city, broke out at a workshop of the Environment No.79 Company, which produces plastic containers for rubbish and waste, a refrigeration workshop, a wood-based product facility, and a silica gel workshop, at a total area of some 1,000 square meters. The fire was extinguished four hours after it broke out. A total of 957 fires and explosions occurred in Vietnam in the first quarter of this year, killing 30 people, injuring 57 others, and causing property losses of more than 154 billion Vietnamese dong (roughly 6.7 million U.S. dollars), according to the country's Fire Prevention and Fight Department.